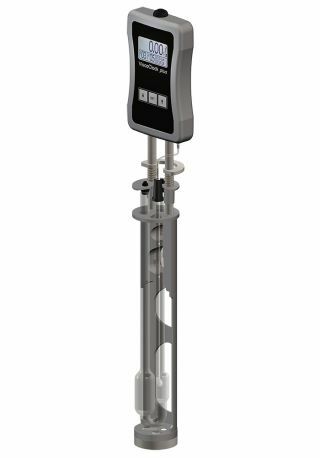 The ViscoCIock plus is designed for SI Analytics® Ubbelohde, Micro Ubbelohde and Micro Ostwald viscometers. The flow time is measured automatically by two infrared light barriers which detect the passing liquid meniscus. The repeatability of the automatic time measurement is considerably higher in comparison to the measurement using a stop watch. 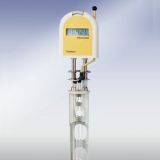 Therefore some viscometry standards allow a flow time reduction in case of automatic fl ow time measurement. The ViscoCIock plus can be used for measuring temperatures ranging from -40 °C to 150 °C. The stand of the ViscoClock plus ist made of high quality polymer PPA. For temperature stabilization in a thermostatic bath, the following liquids are suitable: Water, alcohol, glycol, paraffin oil, and silicon oil. The electronic measuring unit is built-in to a PP casing. The ventilation of Ubbelohde viscometers is managed by an electromechanic valve which makes handling easier in comparison to the mechanical mechanism of the previous ViscoClock. The measuring results of the ViscoClock plus can be stored on a USB fl ash drive including date, time and sample/viscometer ID. The data are stored as pdf (non-editable) and csv (editable). Alternatively, for data transfer the ViscoClock plus can be connected to a printer (TZ 3863) or a PC. To allocate the stored measuring results, the user can enter 2-digit numbers to the ViscoClock plus before measurement. These IDs – together with date and time – ensure an unambiguous assignment of the flow times. 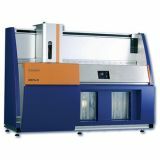 To determine absolute kinematic viscosities, calibrated viscometers have to be used. To guarantee best accuracy, viscometers which were calibrated by automatic measurement should be used. The constant of automatic calibration can be slightly different in comparison to manual calibration, as the level of the light barriers may not be identical to the position of timing marks. For determination of relative viscosities, calibrated as well as non-calibrated viscometers can be used. For evaluation, the calibration constant is not required in this case.